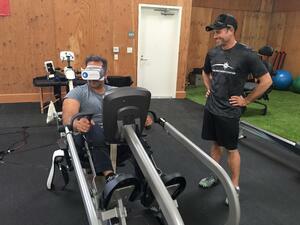 Transforming Rehabilitation with Virtual Reality. an artificial environment which is experienced through sensory stimuli (such as sights and sounds) provided by a computer and in which one's actions partially determine what happens in the environment. Virtual Reality in the medical setting has been clinically proven to reduce stress and anxiety, aid in pain management and reduce the need for prescription pain medication. The known benefits of VR in pediatric and general medicine are continuing to grow daily, with general acceptance that VR improves mental wellness. As studies show, VR and Virtual Reality NeuroTherapy may effectively ‘trick the brain’ into believing that it is physically preforming actions that are being simulated in the VR environment, and can encourage the brain to fire neurological pathways under these circumstances that have otherwise been ‘turned off’ for some time. Virtual Reality is believed to activate the brain’s mirror neurons – neurological pathways responsible for the execution of goal related motor actions. Mieron is one of the leading pioneers when it comes to virtual reality and neurotherapy. First offered as an enterprise application for healthcare facilities and practitioners, Mieron has recently begun to offer an at-home solution that makes it easier than ever to get started with virtual reality rehabilitation. Mieron's goal was to get VR neurotherapy in the hands of those who need it the most. They saw the benefits and they knew they had to make it easier to obtain. MieronGO, the home-use version, has dozens of experiences that are inclusive for people in a variety of situations and use-cases, but most notably the program offers neurotherapy for spinal cord injuries, traumatic brain injuries, paralysis, stroke, PTSD, pain management, physical therapy, mental wellness, and more! 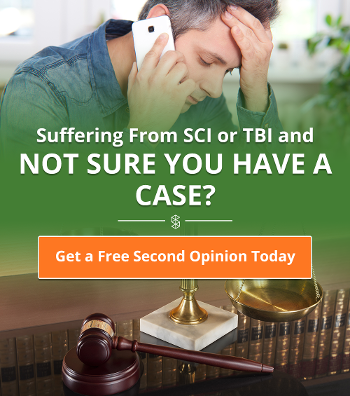 With the offering of an At Home version, SpinalCord is able to provide our readers with special pre-sale access and discounted pricing for Mieron VR. This is an awesome opportunity for those who want to test, challenge, and improve their mobility, dexterity, and more! Available for a onetime fee, you'll receive a library full of experiences and the hardware needed to get started. Expansion packs will be available for purchase in the future. And if you're a SpinalCord.com subscriber, you will receive 50% off your purchase of MieronGO.